“42.4% of veterans in the US reported previously owning a business or being self-employed, compared to 35.7% of non-veterans,” cites the Veterans Business Outreach Center of Illinois. On April 10, Heavner, Beyers and Mihlar proudly assisted more than 20 veteran entrepreneurs in business development. Partnering with co-sponsor JPMorgan Chase, the Veterans Business Outreach Center at the Women’s Business Development Center, the U.S. Small Business Administration and Decatur SCORE, the law firm participated in the Veterans Business Double Header on Tuesday, April 10, at the Civic Center in Decatur, Illinois. In addition to the veteran business owners in attendance, local entrepreneurs were invited to attend the no-cost event. The event featured two workshops on small business finance and legal issues. JPMorgan Chase presented ‘Financial Fitness For Start Ups’. Meredith Pitts of Heavner, Beyers & Mihlar LLC presented ‘Destination Success: Organizing a Small Business Start to Finish’. 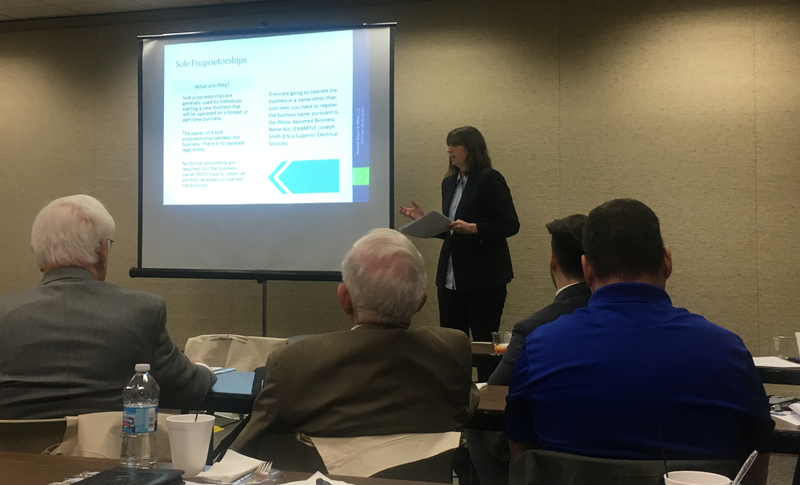 Meredith Pitts’ presentation provided an overview of the advantages and disadvantages of sole-proprietorships, general partnerships, LLC’s and corporations. She provided the veterans in attendance with information on the processes of establishing LLCs or corporations, including fees and processes to file articles of organization and articles of incorporation in Illinois.